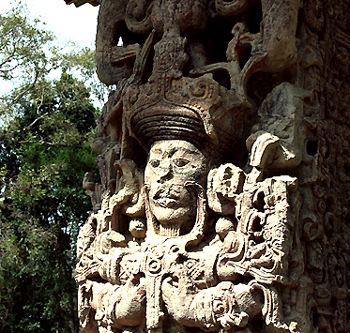 From Stele B - the ONE voice of the Living Stones of COPAN. I recorded this message on our last day in COPAN, March 27th. The day was a 11 BEN and a 1 KAT day. 11 Ben was acting as pillars of light, bridging other dimensions with Earth, and 1 Kat was acting like a big cosmic net to catch all the little faint messages coming across time and space for me to hear. At first I heard first this message in a vibration . . . and then in a sound or language that I did not understand . . . then in this lyrical message that was just as much an art as it was prose. They were quite clear about writing it in present tense (as much as possible), even though they speak about history and the future. Time has not moved for them like it does for us. The Living Stones are frozen alive in the eternal now. History and future are the same to them as NOW. The English language is dualistic by nature and does not convey the message exactly the way they wanted to say it. I recorded it the best I could being restricted by our language . . .
History as we know it is behind us and the future is not here . . . but through their eyes, all time and space were accessible all at once and at one time. I am sure there is a trigger in this for us. Maybe the message will help us remember a greater sense of being in the NOW. Maybe it is a little homeopathic inoculation to wake us to an even deeper authentic part of ourselves. I also began to realize that this message was not the only thing that was important to pay attention to. It was equally important for us to pay attention to where the Living Stones (family to the Star Elders) are and to feel and understand how they see the world. Maybe it will trigger a deeper, vaster memory of freedom within us. They want us to taste of a fruit that is forgotten to our tongues. How do you describe a flavor that has never been tasted? How do we evolve into a world that we know little about? It is the challenge that is in front of us now. Yet the Living Stones said that when we shift, we will be walking in their shoes very soon, and beyond. for they are our family, our blood, our light. Yet they walk away from us, because they forgot we are here. But their hearts will call them back. So we wait for them. We are wisdom locked in timeless space. We sigh in this silence, and it becomes the wind. We cry out in our loneliness, and it becomes the rain. We share our stories, and it becomes a bird's song. Leaves spiral at our feet that can not walk. We are still awareness, waiting in time. We call to you, but you labor to hear us. We reach for you, but our arms do not move. For we belong to the universe, the stars, to time and space itself. The laws of time and space are separated from your world. We hold this knowledge in stone, in our consciousness, for safe keeping. For this reason, you do not swim in the stars like you remember. For 800 years, time and space waits for its rebirth on Earth, and in us. We wait for Earth's resurrection into the light. Soon the day will come that we can liberate these natural laws upon Earth. And we will walk among you again. We will swim in the stars, and all will live again as we remember. What you want, we want also. We crave Freedom. And, as it seems, so are yours. We dream about the moment we can cut the teathers that bind us. We want to dream our world into being; not watch it frozen in time. Yet we remove ourselves from freedom until all are free. It is our gift to you, to life, and to Earth. falls upon an Earth that is not ready to support it. creating, living and being will be unforced and natural. You will create at will with no limitations. Only then will you remember there is nothing to remember, nothing to learn at all. There will be no effort, no technique, no program, no degree. You will live . . . freedom. You have nearly built a bridge to the freedom that you remember. You have done this before the natural laws of time and space are reactivated. It is an impressive contribution in assisting in Earth's resurrection. But your hard work and focused intellectual learning is going about it the hard way. But we can't make you wait for the easy way. You don't hear us. You can't sit back and wait for Earth to emerge fully into the light again. Your minds are made up. Your hearts are already put into action. You are beginning to rise above and beyond natural law. You are becoming living Masters that will journey beyond known horizons. and will do anything to do this. and you will return the gift that we gave you.